For Windows 10 users with touchscreen-enabled PCs, Microsoft's latest version of its operating system offers a feature that truly makes the most of having a touchscreen included with your computer. Called Tablet Mode, it's exactly what it sounds like: a mode that allows you to interact with your PC primarily by using its touchscreen, just as you would a tablet. Tablet Mode is an optional feature allowing Windows 10 users with touchscreen-enabled PCs to use their device by touching their screen, rather than using a mouse and keyboard. Tablet Mode displays the Windows 10 user interface in such a way that optimizes the PC's use as a tablet. Such optimization usually includes large app icons, fewer icons displayed, and an on-screen touch keyboard. If you're a long time user of Windows PCs, you're probably more familiar with Desktop Mode than Tablet Mode. Tablet Mode is a more recent feature, created to allow users to interact with their PCs without using their keyboard or mouse. Desktop mode is essentially Tablet Mode's predecessor, offering a classic Windows Start menu and desktop with as many thumbnail-sized program, app, and document icons a person could want. The main difference between the two modes is their appearance. Desktop Mode provides a classic point-and-click workspace, while Tablet Mode largely eschews the display of many tiny icons, in favor of large, square app tiles featuring animations or content slideshows. The classic Start menu appears to be missing from Tablet Mode, but it's really been moved to the center of the screen. 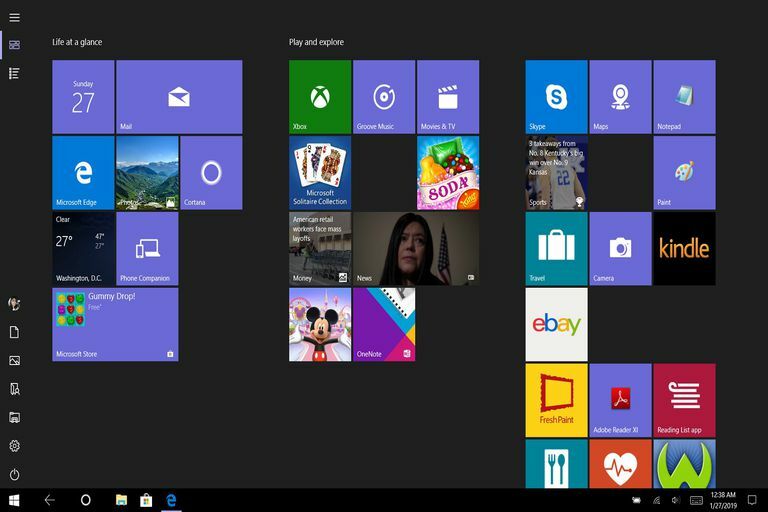 The large tiles are the Start menu and they're no longer relegated to the left-hand corner of the screen as they would have been in Desktop Mode. There are at least three ways to access and enable Tablet Mode and its settings within Windows 10. Select the white, square Start icon located in the lower left corner of the screen. You should see Tablet mode's customization options, including the ability to enable it upon startup will appear in the center of your screen. You can also select Use the appropriate mode for my hardware to allow the system to choose the best mode for your hardware. To choose how you want your system to automatically switch between modes, select the When this device automatically switches tablet mode on or off dropdown menu, then select Don't ask me and don't switch, Always ask me before switching, or Don't ask me and always switch. Type "tablet mode" into the Taskbar's Search bar, located next to the Start menu icon, in the lower left side of the screen. The first search result that pops up should be "Tablet mode settings." Select this to be taken directly to the Tablet mode settings. Repeat steps 5-8 above to customize your tablet mode's settings. A large menu will appear from the right side of the screen. At the bottom, select Tablet mode to quickly enable Tablet Mode's features for your computer's display. Select the Tablet mode again to disable Tablet Mode's display features.